The Partnership Summit is Mount Olivet’s steering team for our community engagement. Made up of Mount Olivet members in leadership roles for each individual partner, the Partnership Summit meets quarterly to discuss where the Holy Spirit is showing up in the life of our church and our partners, how we can deepen and strengthen our involvement with our partners, and what we can do to support one another in problem-solving and leadership development. Contact Pastor Joel with questions or concerns. sign up for our monthly mo partner OPPORTUNITIES email, and we will let you know what opportunities are available for you. 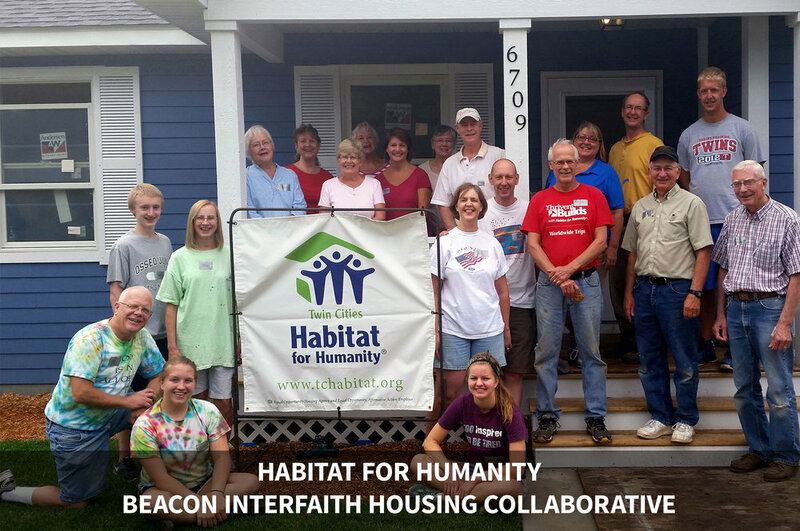 Beacon Interfaith Housing is a collaborative effort of 90+ local congregations to end homelessness in Minnesota. Families Moving Forward uses the Mount Olivet building to shelter families experiencing homelessness. Habitat for Humanity is an organization that helps low-income families become homeowners by building and remodeling houses. KidPack assembles and distributes non-perishable meals to give to students experiencing food insecurity at Northport Elementary School in Brooklyn Center so they have something to eat over the weekend. PRISM is a food shelf, thrift store, and housing counseling agency in Golden Valley that helps people get their basic needs met in a way that honors their dignity. April: Plastic/Paper Bags & Kids Clothes/Shoes; May: Teen & General Hygiene; June: Kid Friendly Goods & Pantry Staples; July: Picnic Foods & School Supplies; August: School Supplies & Paper Products; September: Cleaning Supplies & Plastic/Paper Bags; October: Winter Clothes & General Hygiene; November: Holiday Toys & Paper Products; December: Holiday Toys & Pantry Staples. Stock shelves, guide shoppers through the food pantry, or sort items for the thrift shop. PRISM welcomes volunteers for a two-hour shift EVERY SATURDAY in the Shop For Change Thrift Shop. Children 12 and older are welcome under adult supervision. Contact Kevin Lytle, Marlene Stimpson, or Diana Kallestad. Dinner at Your Door delivers meals to home bound folks in Crystal, Robbinsdale, New Hope, Golden Valley, Brooklyn Park and eastern Plymouth. Contact Bob Carlson for more information. Serve and share a free dinner with people experiencing food insecurity in Minneapolis. Contact Deb McDonald to get involved. Get involved by attending Mount Olivet Night at Second Harvest where we repack bulk goods obtained from individual donors, donor companies, and local growers into family-sized packages. Email Joni Marti with any questions. Parenting with Purpose provides mentorship and support to children with a parent experiencing incarceration. Become a mentor and form a supportive relationship with a child who has an incarcerated parent. Looking for mentors able to commit to two hours per week for a year. Contact Ron Frehner and Deb Murray. Home Free is a shelter on Medicine Lake for women and children fleeing domestic violence. Donation bins are located across the hallway from the Mount Olivet Resource Center. Donate: used cell phones, clothing and personal items including toiletries and cleaning supplies. To volunteer with Home Free, contact Jolynn Zeller. 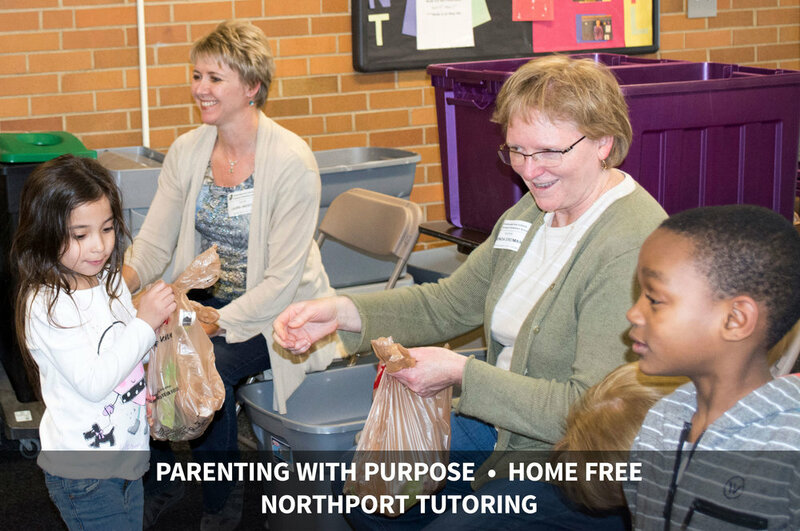 Tutor students at Northport Elementary School in Brooklyn Center by regularly assisting students in reading and math while building positive relationships. Volunteer and program support, contact Randy Svendsen.